What’s Going on in Baseball? In no particular order, here are some comments, thoughts, observations, and perhaps even an occasional insight at this point in the 2015 baseball season: ** For those of you who can remember back to preseason, I wrote about the new baseball rules for shortening games and predicted they’d work (see: It’s Gonna Work – Betcha). At the All Star break this year, roughly the halfway mark of the season, the average length of the games was down almost exactly 10 minutes. The rule about batters having to keep one foot in the batter’s box accounted for half of the reduction in game time. Calling for a play challenge from the dugout and limiting the time between innings, probably make up the other half. Recently, however, the game time has crept up a bit. (It seems to me that batters are staying out of the box more now than they did at the beginning of the season, perhaps because MLB and the Players Union agreed not to use the financial penalties that were supposed to kick in in May?) ** If you think there are more no-hitters this year than last, you’re right (six already versus five for all of last year). And there were 33 no ‘hitters’ thru 6 innings (better than all of last year), 17 through 7 innings and 10 through 8 innings. But pitchers on the whole are doing worse than last year. The ERA of all the Major League teams is up over 2014, from 3.74 (full season) to 3.82 (thru 8/31/15). Batters are doing better (makes sense if ERA is up) in all categories: Ave. – 254/.251, OBP – .315/.314, SLG. – .402/.386, and OPS – .718/.700. Fielding PCT is virtually unchanged (.985/.984). 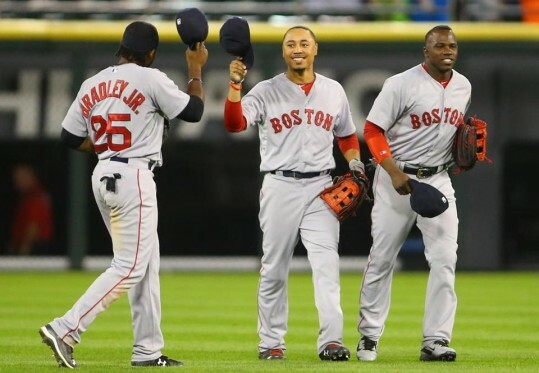 ** What’s up with the Sox? They have been out of it for most of the season, largely because of weak pitching and weak hitting. (Outgoing GM Cherrington should’ve listened to me when I said stay away from Hanley Ramirez). They have done well over the past several weeks as they have settled into what is likely to be an outstanding outfield — Bradley, Betts, and Castillo (photo below) — for next year and beyond, tho it’s not clear yet which position each will play in that outfield. Their hitting is up and so is their starting pitching; relief pitching, however, has worsened, especially with the loss of Uehara for the remainder of the season. They have a modest chance of avoiding last place if they continue at their present pace. Everyone is on their toes trying to prove to their new president of baseball operations Dombrowski that they deserve to play next year.